Entrepreneurship Bootcamp, a fall semester, one-day glimpse into entrepreneurship at CMU and Pittsburgh, is the kickoff to our CONNECTS series. Learn the ins and outs of entrepreneurship at CMU and in Pittsburgh from the perspective of startups and students. Meet members from Innovation Works, AlphaLab, AlphaLab Gear, CTTEC and many more. Interested in entrepreneurship but have little to no experience? Learn the vocabulary and how startups differ from small businesses. Through this panel discussion learn the building blocks from research to commercialization. Experience CONNECTS, which formally connects you with the entrepreneurial community around you. Learn the ins and outs of entrepreneurship at CMU and in Pittsburgh from the perspective of startups and students. Meet members from Innovation Works, AlphaLab, AlphaLab Gear, CTTEC and the Robotics HUB. Experience entrepreneurship as a career and internship. Walk to Project Olympus for the remainder of Bootcamp for an informal networking event. Over 300 attendees packed CMU's Rashid auditorium on Saturday, September 10, 2016 for the Swartz Center's annual Entrepreneurship Bootcamp. Executive Director, Dave Mawhinney, moderated panel discussions featuring student participants from CMU's Graduate Entrepreneurship Club (GEC), Undergraduate Entrepreneurship Association (UEA), Undergraduate Innovation Scholars, Swartz Fellows, Innovation Fellows, PROBEs, NSF I-Corps Site Teams, OFEF and others. A second panel included the Center's partners, CMU's Center for Technology Transfer and Enterprise Creation (CTTEC), Robotics HUB and AlphaLab, AlphaLab Gear. Austin Webb presented Entrepreneurship 101 covering such topics as the Business Model Canvas and How to Pitch to Investors. 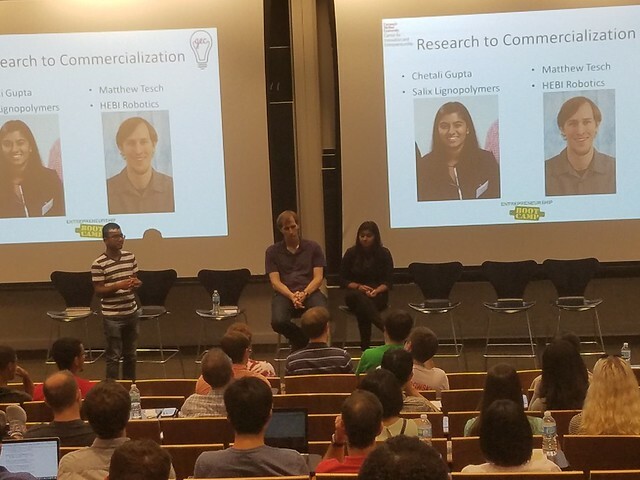 Chetali Gupta and Matthew Tesch spoke about Research to Commercialization, moderated by Swartz Fellow Matharishwan Naganbabu (Mellon College of Science). A networking event at Project Olympus rounded out the day where participants were able to tour the space and practice pitching startup ideas.